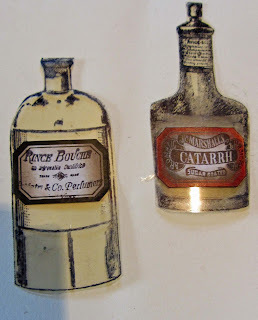 Eclectic Paperie: Mixed Media Fun Time ! Hi everyone it's Toni here to share a mixed project I've put together. I know you may think I'm a bit premature for Halloween but I just got a bit carried away! 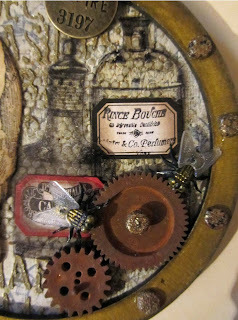 This project came about after I saw that Kim had some of these Wendy Vecchi Art Parts Pocket Watches in the eclectic Paperie clearance sale. I've been hoarding a couple of these for a while and thought it may be a good idea to showcase how to have some fun with one. The pocket watches come in three parts, I've just used the back and the outer frame, I'll save the inner circle for something else. I started by coating the surfaces with Studio Gesso. I then painted the frame with Tarnished Brasss Distress Paint Dabber. I smoothed this over by brushing the surface lightly with a soft paintbrush. Next came the three stages of stamping and texturising the surface. 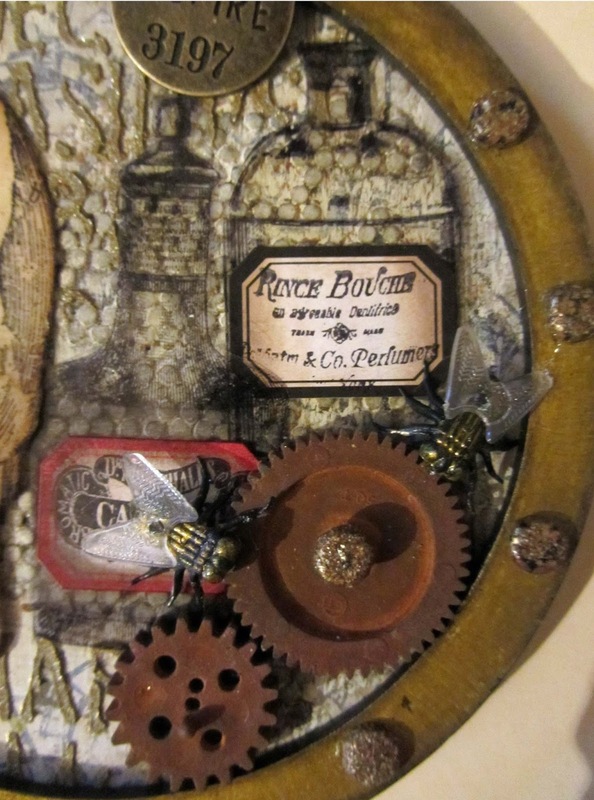 I started with Tim Holtz's Industrial Blue Print cog stamp, (also on clearance at the moment! ), I used the smaller cog stamp from the Stampers Anonymous Mini Blue Prints #3 as well. These have all been stamped with Black Archival Ink. I then used Wendy Vecchi Embossing Paste through The Crafter's Workshop Tiny Circles stencil, and once dry, gave the surface a rough coat of Antique Linen Distress Paint and once dry, I sanded it back to reveal some of the stamping . I then rubbed in Vintage Photo Distress ink and also Black Soot for a bit more grunge. Once all this was dry, I used The Crafter's Workshop Roman Letters stencil with gold Ferro Paint. Finally, after I was happy with the background I started on the contents inside the frame. I stamped out the large Stampers Anonymous Skull onto manila card using black Archival Ink, I also stamped a couple of apothecary bottles onto acetate. The stamps are from a Graphic 45 Set I've had for some time. The labels are from Ideaology, stamped using the same G45 set. 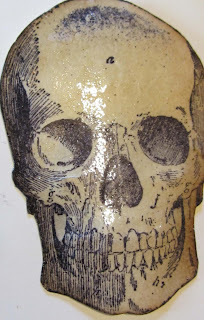 Here's the skull after it's had the Antique Linen treatment and then heat embossed with Clear Embossing Powder. The centre is a butterfly pin which I've 'rusted' with Vintage Photo Distress Embossing powder mixed with a bit of gold Frantage. I used the same technique on the studs around the frame and cut the backs off before adhering with a glue gun. 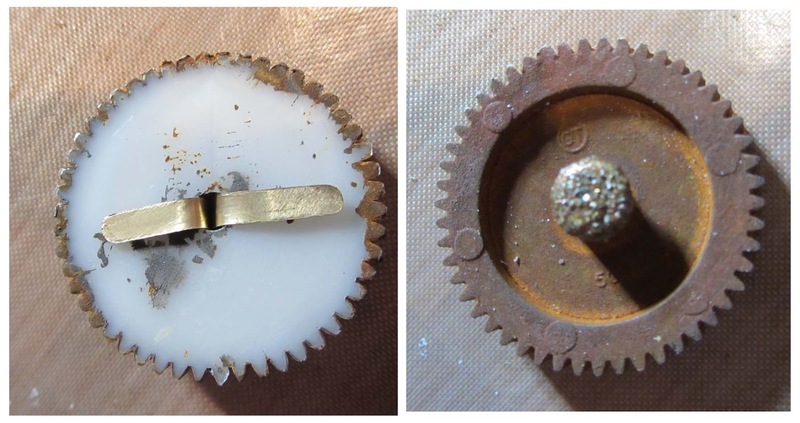 If you decide to try this I recommend using tweezers to hold the studs when heating or placing onto hot glue. I used a black Faber Castell Big Pen to colour the inside and outside edges of the frame. I couldn't resist adding the little plastic flies. My son had given me these as he thought I might use them for crafting. He knows me very well ! This is fab, Toni; totally up my street! 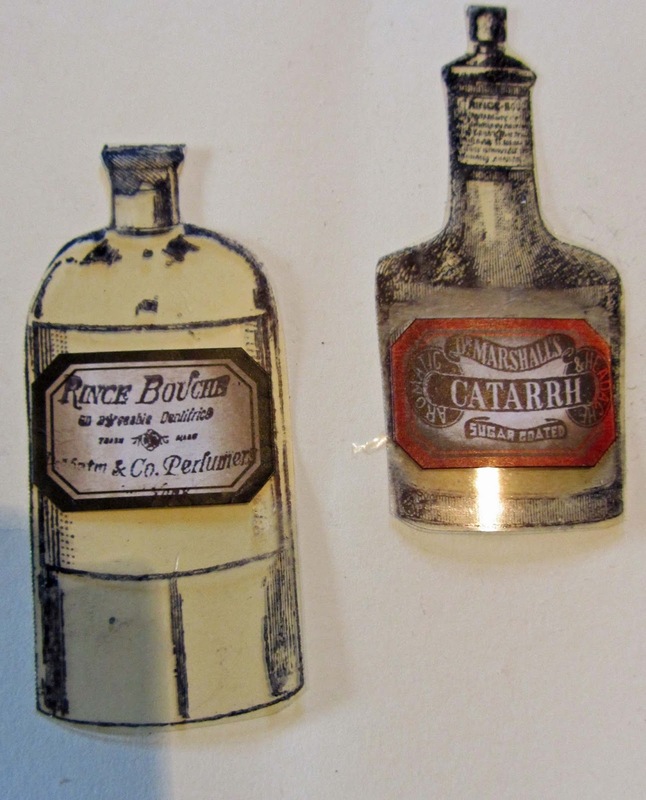 I love the rusting, the acetate bottles, and all your attention to detail! Wonderful make! Awesome, Toni! 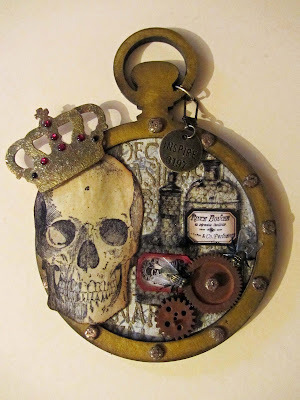 I adore that pocket watch art part and you're created a stunning piece!! Oh my giddy aunt Toni...you have made a fabulous job with the pocket watch..loving the halloween vibe!!! Toni your make is wonderful and I love it and YES you have given me some ideas!! Wow!!! I love this piece!!! Great spooky piece for Halloween! oh this turned out great. Love the halloween theme!!!! And a great way to use the clock/watch. Love it. Beyond brilliant, Toni - every element is absolutely delicious!